We’ve written before about California’s prompt payment laws which are designed to help contractors get paid in a timely and orderly fashion, which is always nice, right? California’s prompt payment laws require that project owners pay their direct contractors, who are in turn required to pay their subcontractors who are in turn required to pay their sub-subcontractors and so on within certain statutorily set deadlines, or be subject to prompt payment penalties nearly as high as the interest you pay on your credit cards. So, for example, on private works projects, unless otherwise provided in their construction contract, a project owner is required to pay progress payments to its direct contractor within 30 days after notice demanding payment (e.g., a pay application) and retention within 45 days after completion of the work of improvement unless there is a good faith dispute. California’s prompt payment statutes may not have kept pace with changing contract practices, however. Increasingly, sophisticated contractors have begun to argue for contractual provisions which reduce or eliminate altogether retention at agreed-upon project milestones (e.g., 50% completion), the argument being that a project owner’s withholding of retention as security to protect against a contractor’s non-conformance or non-performance becomes increasingly less necessary the closer a project gets to completion both because of the accumulation of previously withheld retention and because overall project costs are lower as a project comes to an end. In fact, in 2012, the California State Legislature saw fit to institute a 5% cap on retention, subject to certain exceptions, on public works projects. But if an owner contractually changes course and agrees to reduce or eliminate retention, what is a direct contractor’s (or subcontractor’s) obligation to release previously withheld retention to their subcontractors? In Blois Construction, Inc. v. FCI/Fluor/Parsons, California Court of Appeals for the Second District, Case No. B262310 (March 23, 2016), the California Court of appeals addressed this very question. In 2006, the Exposition Metro Line Construction Authority (“Expo”) contracted with the joint venture FCI/Fluor/Parsons (“FFP”) to serve as the general contractor on the Exposition Light Rail Line connecting downtown Los Angeles with Culver City and ultimately Santa Monica. FFP in turn subcontracted with Blois Construction, Inc. (“Blois”) for underground construction work. Both the prime contract between Expo and FFP and the subcontract between FFP and Blois contained a retention clause allowing Expo to withhold from FFP and FFP to withhold from Blois ten percent (10%) of progress payments until successful completion of the project. However, the prime contract between Expo and FFP also included a provision which provided that “after fifty percent (50%) of the Work has been completed, [Expo] may elect to not make further retentions from the remaining Progress Payments it if determines, in its sole discretion, that progress on the Work is satisfactory.” In 2009, FFP requested that Expo cease withholding retention, and Expo agreed. By the time Blois had completed its work on the project in 2011, FFP had withheld over $500,000 in retention from Blois. In 2012, Blois filed suit against FPP and its sureties alleging that FPP had failed to pay Blois for extra work that Blois had performed on the project and for release of the over $500,000 in retention held by FPP. On motion of FPP, the trial court referred the case to a dispute resolution board for arbitration. In 2013, while the case was still pending before the dispute resolution board, FPP paid Blois $534,909.89, which was the full amount Blois claimed it was owed in retention. Later, the dispute resolution board ruled that under the terms of the FPP-Blois subcontract, FPP was required to pay Blois its retention, but reserved for the trial court whether Blois was also entitled to prompt payment penalties. Following trial, the trial court ruled that Blois was not entitled to prompt payment penalties because Expo had not released its previously withheld retention to FPP until 2014. Blois appealed. On appeal, Blois argued that the prompt payment statute at issue – Public Contract Code section 7107 – provides that “within seven days from the time that all or any portion of the retention proceeds are received by the original contractor, the original contractor shall pay each of its subcontractors from whom retention has been withheld, each subcontractor’s share of the retention received” (emphasis added); and that because FPP had received a portion of its retention proceeds from Expo that FPP was required to release all previously withheld retention to Blois. The Court of Appeals disagreed. Interpreting the language of Public Contract Code section 7107, the Court held that “the plain text of section 7107” only applies to retention withheld from payment, and because no retention was withheld from FPP’s progress payments after 2009 that “section 7107 does not apply.” In other words, since Section 7107 only applies to “retention proceeds,” and no retention was withheld by Expo, the Section 7107’s prompt payment penalties did not apply. Note: To me, the Court of Appeal’s rationale seems to be a somewhat circuitous. It could have simply pointed out Section 7107’s language which provides that within 7 days of a direct contractor’s receipt of retention from a project owner that the direct contractor is required to pay its subcontractors “each subcontractor’s share of the retention received.” (emphasis added). And because FPP did not “receive” any retention previously withheld by Expo prior to 2009, FPP would not be required under Section 7107 to release any retention it had previously withheld from Blois prior to 2009. This seems to me to be a pretty fair decision which applies to all of California’s prompt payment statutes and not just Public Contract Code section 7107. The prompt payment statutes were intended to provide for the timely and orderly disbursement of project funds, not to allow one party on a project to gain preferential treatment over another. Note: About the graphic above. 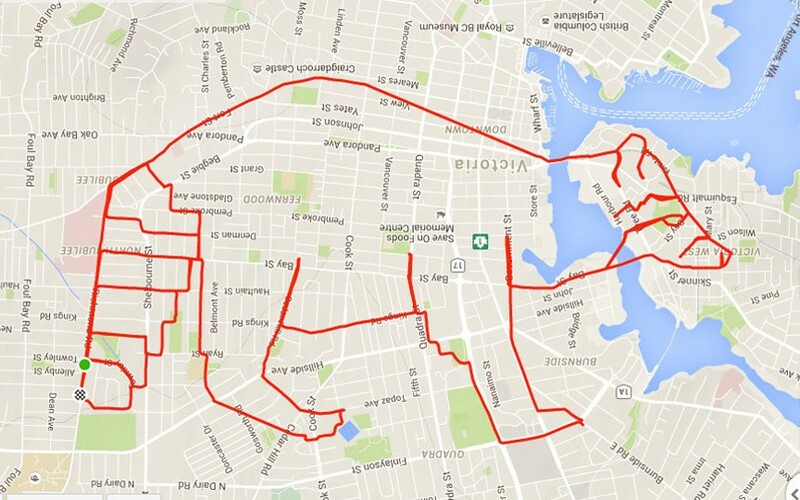 It’s apparently a new trend: Runners creating giant animals (and other things) by using their GPS apps to map their route. There’s even a website devoted to it. I know the post is old, but I searched ‘retention’ and this was the latest. I love this site – I learn so much! I appreciate the time you and your colleagues put into it. Anyway, my question is this: I know Caltrans cannot hold retention to a GC on payment applications per PCC 7202. However, on a Caltrans project, may a GC hold retention on their Subcontractors? Maybe under PCC 4108? I hate not having any sort of leverage with the Subcontractor. Your thoughts/explanations? Sorry, no can do. PCC 7200(b) provides “In a contract between the original contractor and a subcontractor, and in a contract between a subcontractor and any subcontractor thereunder, the percentage of the retention proceeds withheld may not exceed the percentage specified in the contract between the public entity and the original contractor.” So if Caltrans can’t withhold retention, either can it’s contractors. You can always require bonds, however. Thank-you, I was afraid of that! One follow up….PCC 4108 states that if the Subcontractor does not submit the requested P&P bonds, the GC may reject the bid and make a substitution for another Subcontractor. Couldn’t I then hold 5% retention in lieu of a bond? Substituting Subcontractors on Public Works projects is not so simple. You would be limited to substituting the subcontractor. In addition, bonds would be required before the contractor begins work so there would be no money to hold in retention. Love the site! Refreshing to read and always look forward to the tidbits. Re: the bear graphic . . . it looks like a California State Bear (representing California case law?) superimposed on a map of Victoria, British Columbia, Canada. You couldn’t find a more appropriate example of a California State Symbol outlined over a CALIFORNIA city …. say the Desert Tortoise overlayed on Bakersfield (i.e. drought) ? Wow. Bonus points for Victoria, BC! Although I think it’s a raccoon . . . or maybe a raccoon bear. Perhaps I should have looked for a caricature of Stephen Curry superimposed over the streets of Oakland.